Open a page to learning with the Rhyme & Discover Book! Recommended for kids 6 months to 3 years, the Rhyme & Discover Book combines rhythm and rhyme with nursery favorites. The electronic book includes three light-up character buttons on the tabs of the pages. Seven popular nursery rhymes and easy to turn pages encourage playing, thinking, and learning. The Rhyme and Discover Book features four movable pieces that your baby will love. The side of the book features bright colors and a music note button. Light up learning time for your little one with the Rhyme & Discover Book. Parent Friendly FeaturesParent-friendly features include an automatic shut-off to preserve battery life. A durable design allows for long-lasting play while volume controls allow for quieter play. The Rhyme & Discover Book was developed with your child’s development in mind. Age-appropriate vocabulary and nursery rhymes introduce familiar animal names and sounds. Sing-along songs encourage verbal skills and familiar melodies and sing-along songs promote parent-child interaction. The twinkling lights and bright colorful graphics attract baby’s attention. Turning pages promotes gross motor development and sliding buttons strengthens fine motor development. 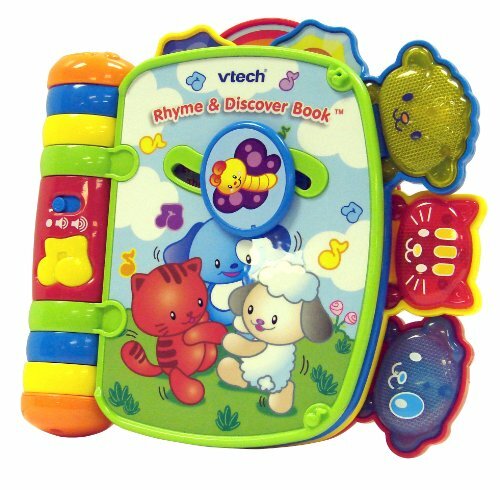 About Vtech Vtech, the creator of the Electronic Learning Products (ELP) category, is a world leader in age-appropriate learning toys. Since 1976, Vtech has been developing high-quality, innovative educational products for children from birth to tween. Its toys deliver ‘smart play’ through the combination of entertaining electronic formats and engaging, age-appropriate content that helps children learn while having fun.Includes 6 colorful pages; 3 light-up character buttons on the tabs of the pages make this a great early learning center this interactive infant book contains 7 popular nursery rhymes and 4 movable pieces; over 20 different songs, phrases, and sounds. Product dimensions: 1. 8 x 8 x 8. 5 inches ; 1. 2 pounds.